Domain is a control of the space to ours around, of the things of the environment in the distance marked by the function to realizing and not only. Brands and distances given by the uses to practising from an original place. 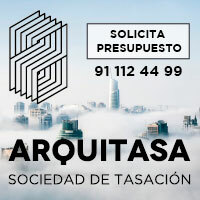 Domain is also to look for site, to be located, to be located and to settle itself, not easy at all task, and of equal form to distribute, to reorganize, to balance, already be in a spontaneous way as in the nature or of form planned since it does the architecture. The conflict is the brand that indicates where they finish or begin other adjacent spaces. Of the possible harmonization of this conflict it will turn out to be the nature of the collective thing, a reequilibrium of forces that organizes the settling of the spaces and the interstices that allow the steps and movements. Only it is necessary to observe the disposition of the bodies in the crammed beaches in summer epoch. It is used, deals more than the properly substantial thing. The persons, the animals and the things seem to spread, due to his nature and the functions that him are own, beyond his area or the first physical space, as if they were radioactive minerals or magnetized metals, like we burn with the energy of the fire before touching the flame. Every day more, it is necessary to thank for having so near the hand works of architecture of great height, that though they are not left to see, for modesty, if they are left to discover with a small effort. Some of these architectures are so near that get confused in the border between two countries, between Galicia and Portugal. One of these spaces liminares of architectural meeting is Moledo do Minho in Caminha, place of extraordinary density of small – enormous architectures and of names that have given both the contemporary Portuguese architecture and the European, and especially also to us the Spanish architects one great example. We wanted to speak in these scanty letters probably of the smallest, humble and maybe stranger of these architectures, Moledo’s infantario, which close to other small equipments and houses of the architects Sergio Fernandez – Alexandre Alves Costa (Atelier 15), Alvaro Siza, Souto de Moura and others speaks about the intensity and high architectural culture of Portugal. 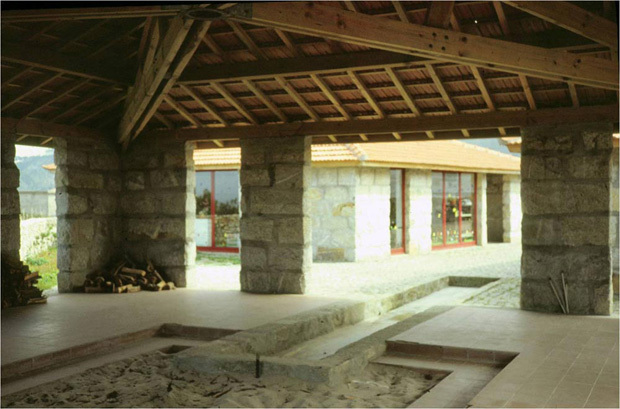 A day-care center in Moledo do Minho that illustrates the growth of a project across the correct interpretation of the use, of the function, of the dimension that both generate, so much in the concretion of the interior space of each one of the pieces as in his general joint in the plant of situation. A pure figure, the square, added to yes same the precise times, three, composes the general plant. The same element that is constructed under the same technology, under the same configuration, but that reaches final different well meanings, though complementary. The first volume, which repeats itself in mirror to form the access, fills, is closed gathering the demanded and own functions to a day-care center, about a stove and a furniture that organizes the central core. Second, transition to the court, empties, becomes permeable and can cross. It is an exterior space with the same architectural configuration that the previous ones. It is opened but it guarantees the protection opposite to the first exterior inclemency, the rain. Also it is a day-care center and not. One is a closed space, to give classrooms to warming for a chimney, other one opened, with a core of sand and water for the game, is atravesable and be transparent. Even this way, altering clearly the functions, the dimensions that these unlike and opposite uses offer are equal and the architecture escapes to the form to be represented only in the dimension, in the distancias, in the separations between the things. Architecture that ensues from a calm and subtle game of objected, in the search of balance to the problem of the opposing and antithetic thing, to fill and to empty, Twin Phenomena like Aldo van Eyck. To subvert and that the architecture like result gives the same thing: empty bottle that begins to fill for below and full bottle that has to empty first overhead and that ultimately, emptying or filling, the magic of the authentic architecture remains inalterably. There exists always a fundamental core, origin that it does of reference and from where certain energy is projected towards the exterior, where ultimately the form is born. This origin, function or use, is the one that later formulates the architecture, function that grows and extends giving us the dimension with which we will work. Rules of the game, brands that organize and limit it and that will turn into the lines identical with the soil of the playground, as the walls and the walls of closing of the architecture but of height zero and all this a long before the tried balance form – function. * Text selected of elaborated for a classroom to the project pupils of the Faculty of Architecture of Oporto, FAUP, in May, 2003 of title: Domain, space to our return and edge. 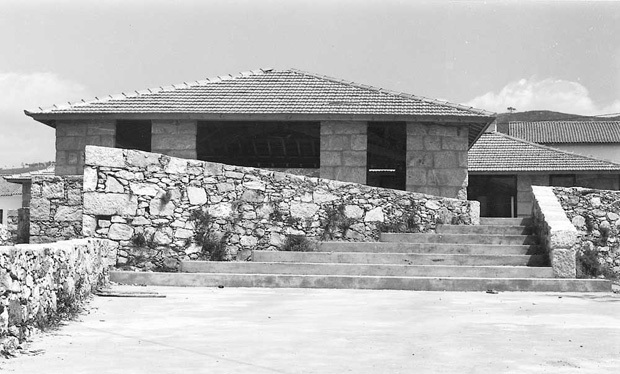 A day-care center of Sergio Fernandez and Alexandre Alves Costa and three Manuel Gallego’s houses.